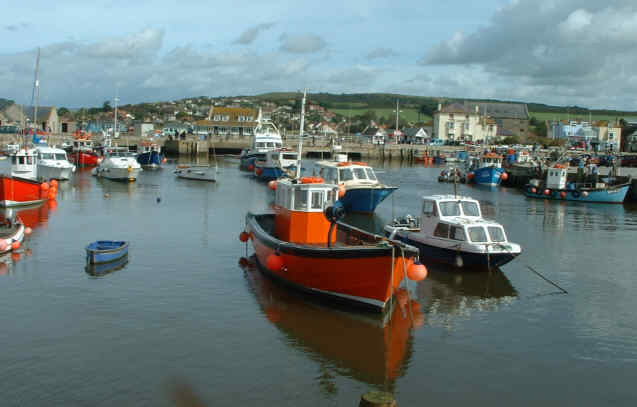 West Bay near Bridport is a small seaside place centred on the harbour which still has some working fishing boats. 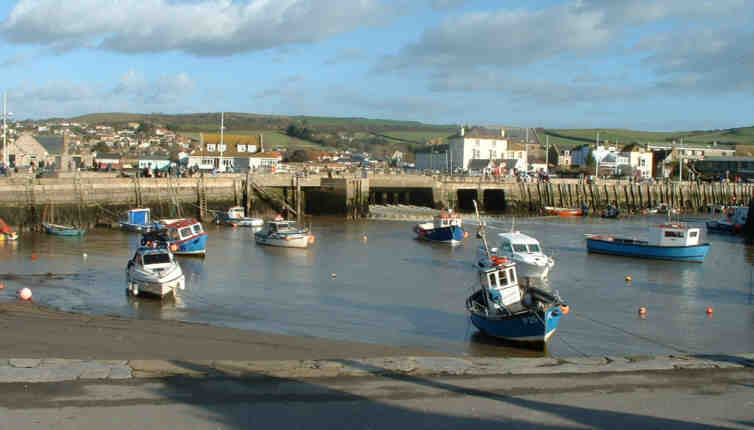 I really enjoy visiting West Bay and do so several times a year which means this page has lots of photos taken over several years which record changes, including some fairly major ones, and the unchanging natural beauty of the area. 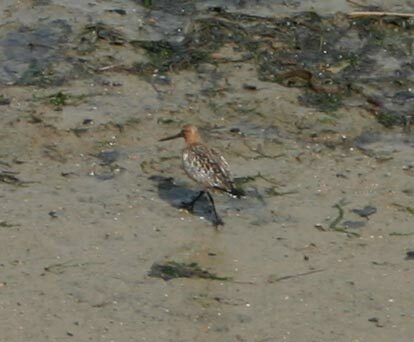 Recent photos are shown full size at the top, older ones have thumbnails to click and are arranged in order around the area. 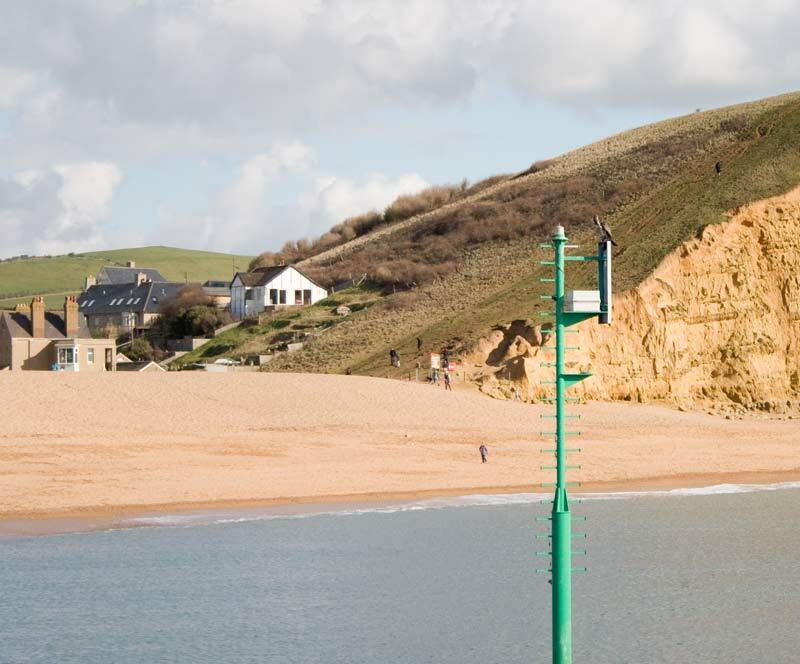 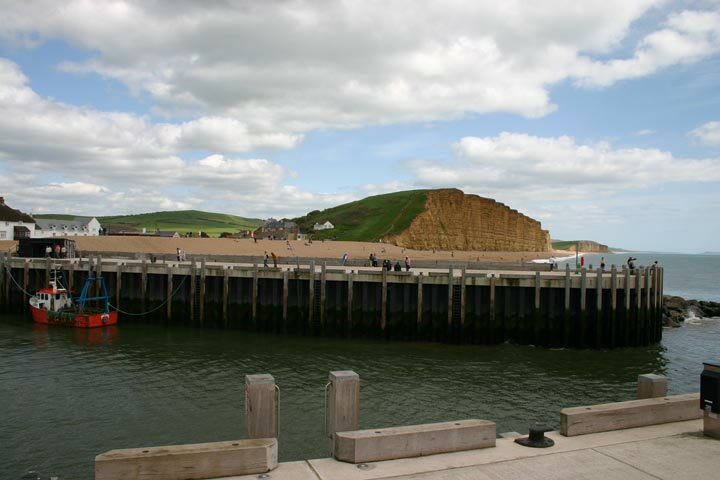 It has recently been used by ITV to film the series "Broadchurch", many years ago the BBC filmed "Harbour Lights" here. 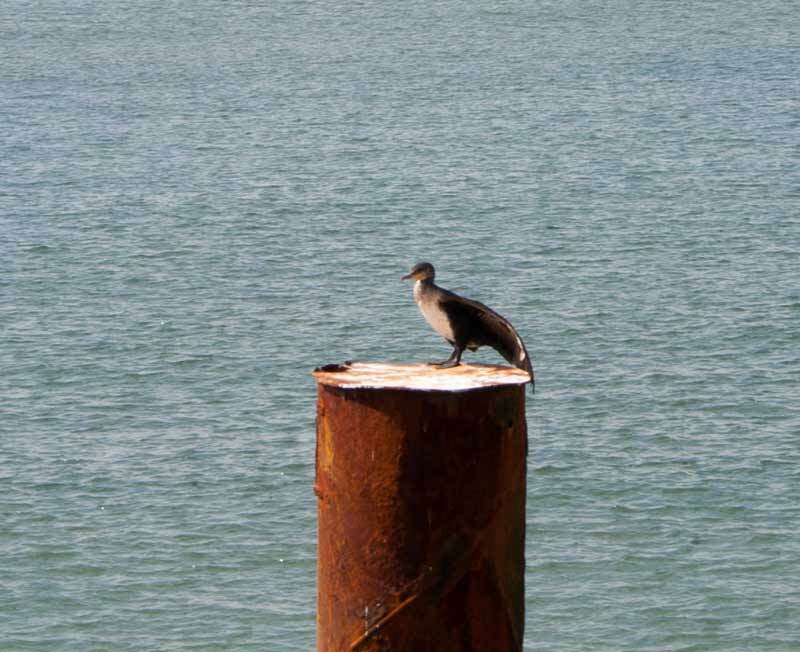 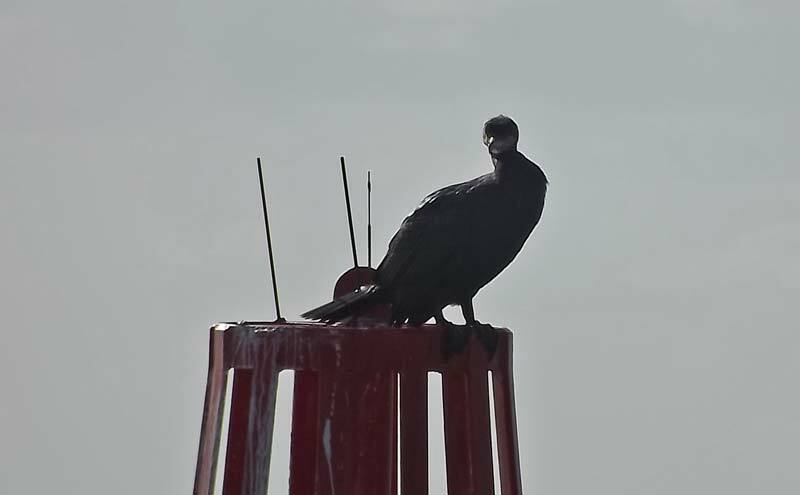 Some rather varied photos from 13 April 2014 starting with two of a cormorant perched on a post beside the west pier of the harbour. 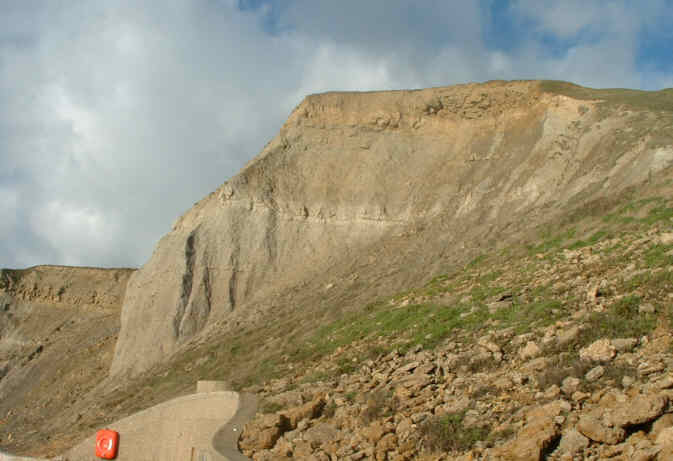 A view of the cliff to the east showing a recent fall, the weather over the last year or so seems to have led to a lot of these around the coast. 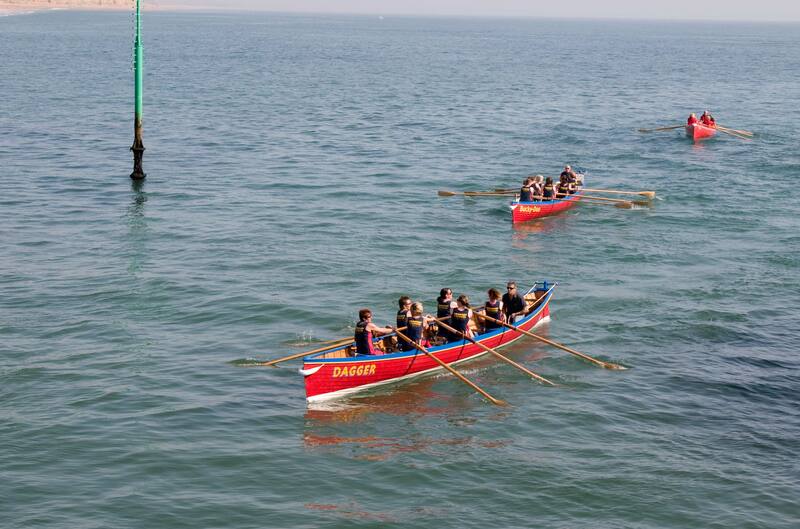 Some ladies rowing a gig out of the harbour. 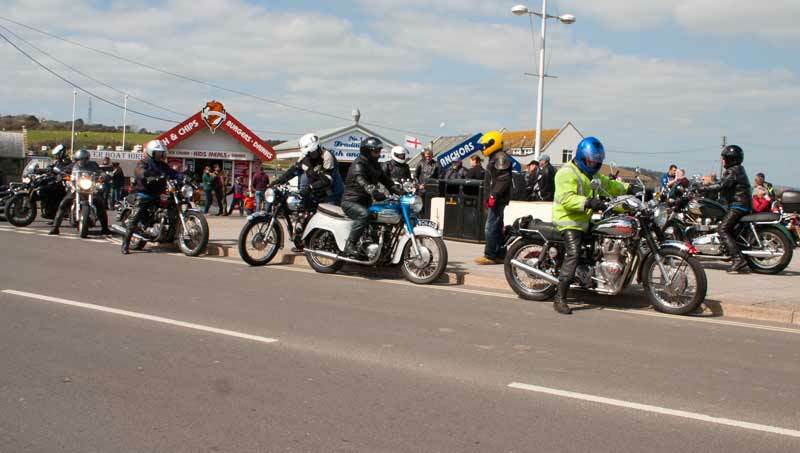 West Bay is a popular destination for bikers on a sunny Sunday, there were some lovely old bikes amongst those there on this visit. 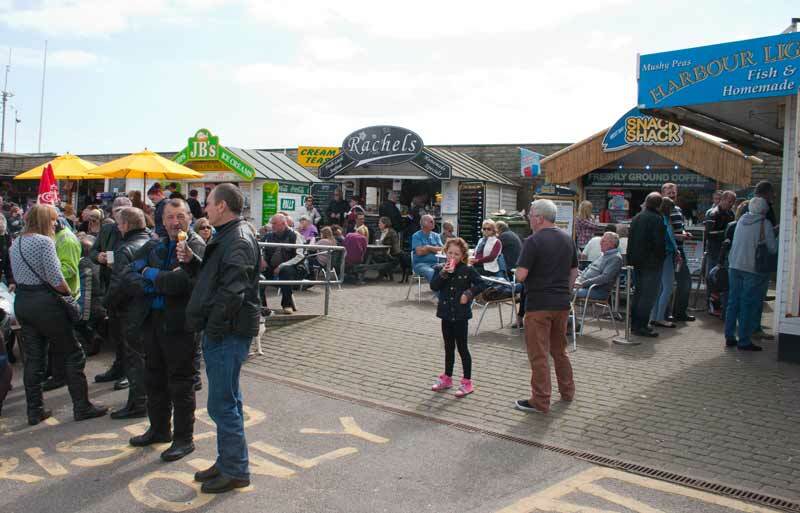 There are some "snack huts" in the background of the above photo, there are more by the harbour - I enjoyed my cheeseburger from Snack Shack! 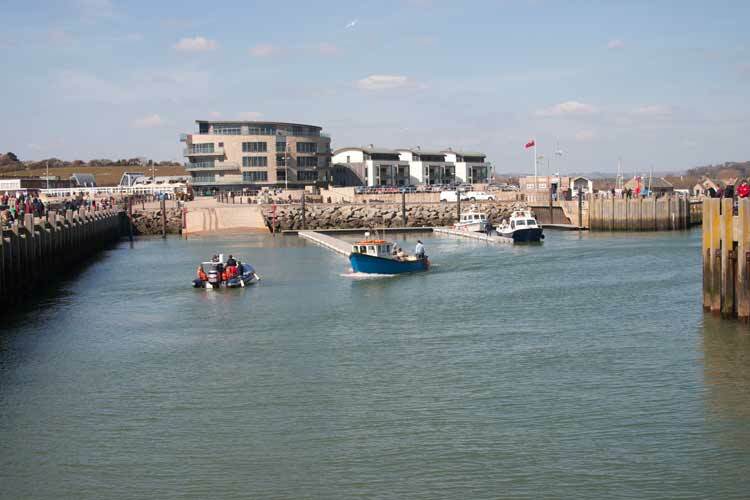 On 6 April 2013 the weather had finally improved after a very cold spring and we made our first visit of the year, this is the view along the new pier toward the recent new development - most of what has changed in the last 10 years is in this photo. 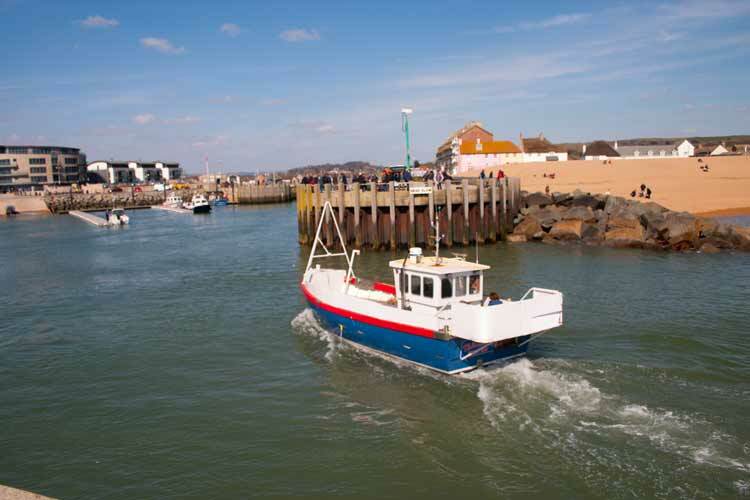 A fishing boat coming into the harbour. 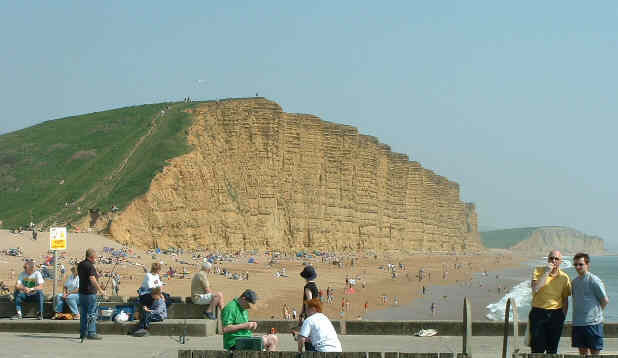 A long range shot from the end of the pier show several rock falls on the cliffs beyond Burton Bradstock. 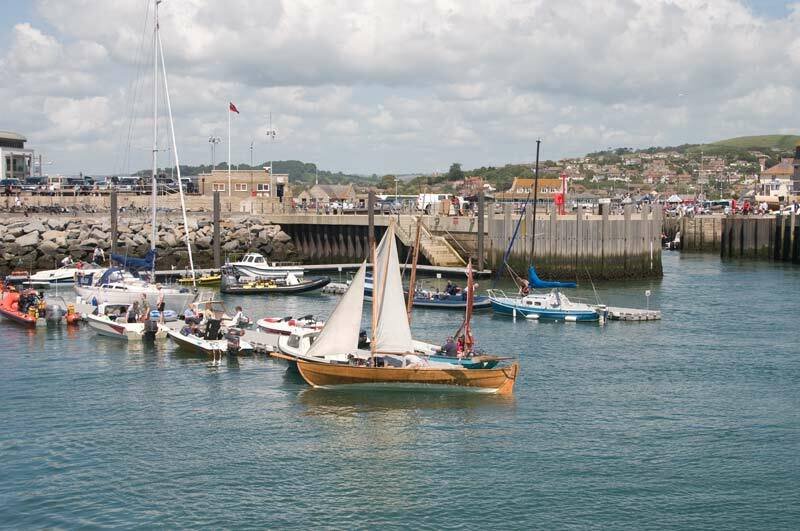 Activity in the outer part of the harbour. 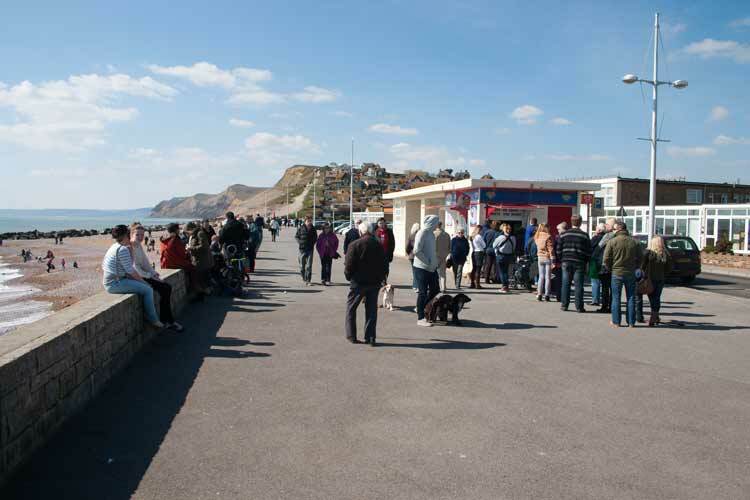 On land it was actually warm enough for a queue to form for ice creams. 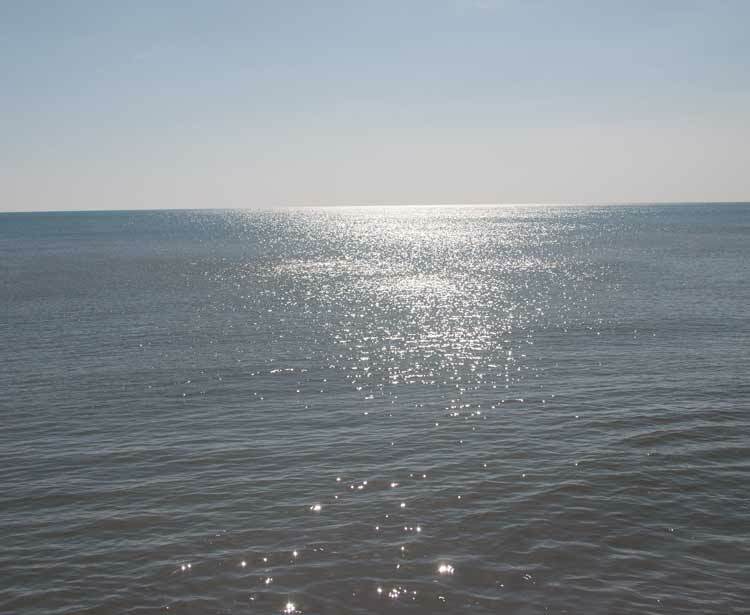 The sun made the sea look as though it was carpeted with jewels. 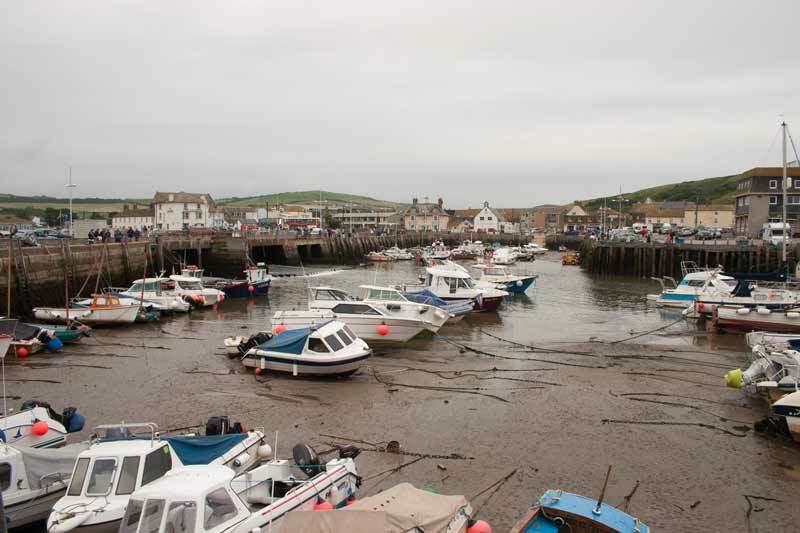 As the tide was higher than usual I took these three photos of the harbour. 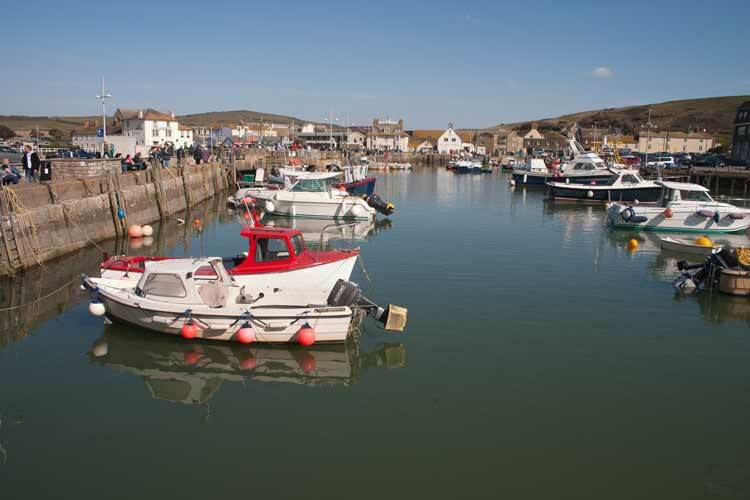 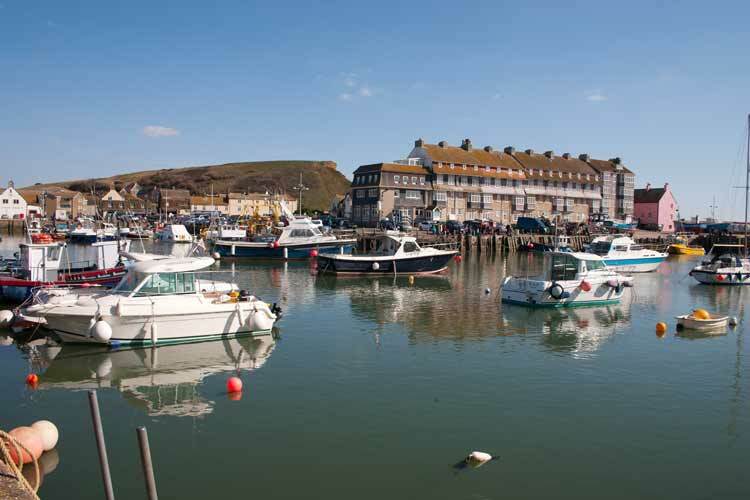 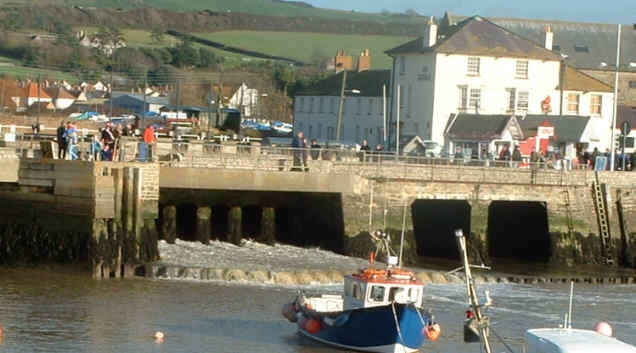 West Bay was the location for the BBC series "Harbour Lights". 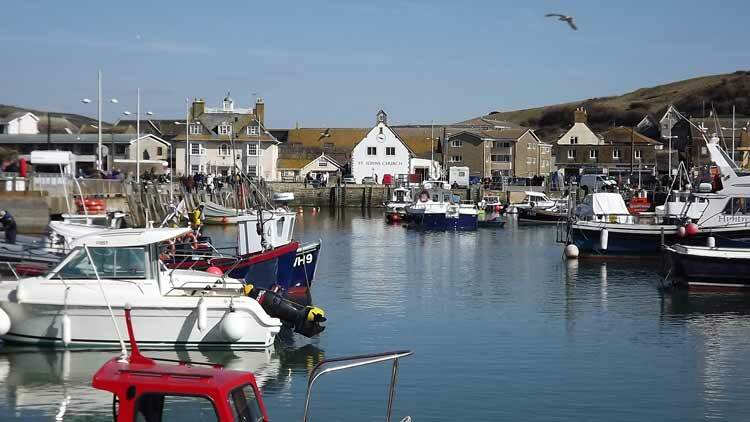 In reality it is a small place near Bridport in Dorset the heart of which is its harbour, seen here being guarded by a seagull as ever on the lookout for a free meal. 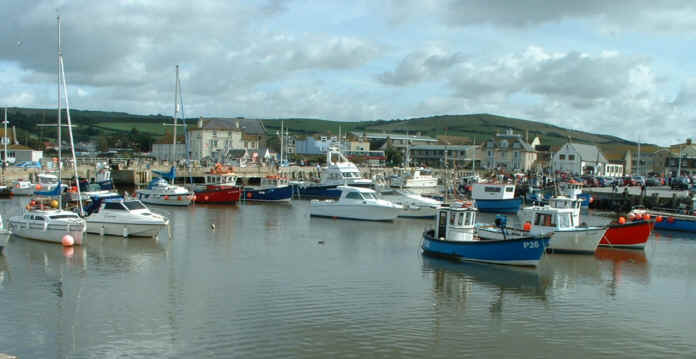 A wider view of the harbour. 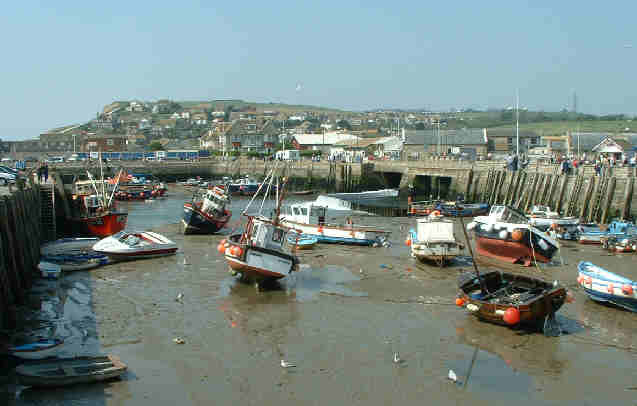 Most of it is dry at low tide, leaving the boats lying at odd angles. 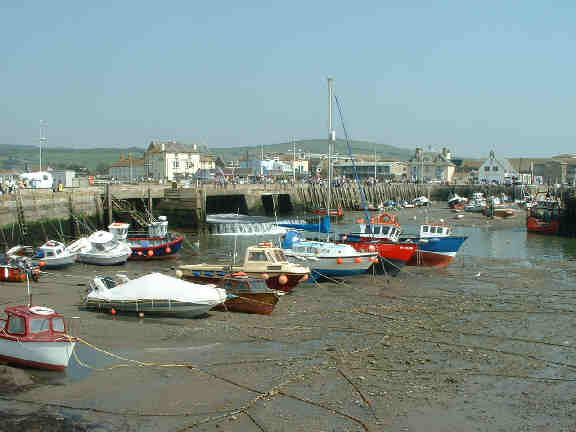 Part of the harbour still has water at low tide. 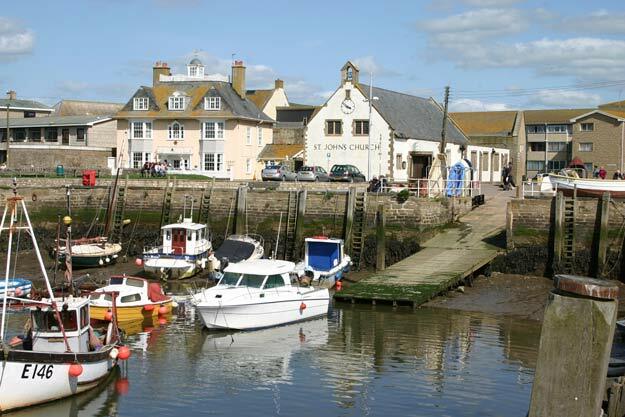 The harbour in two halves with the waters of the River Brit dividing them. 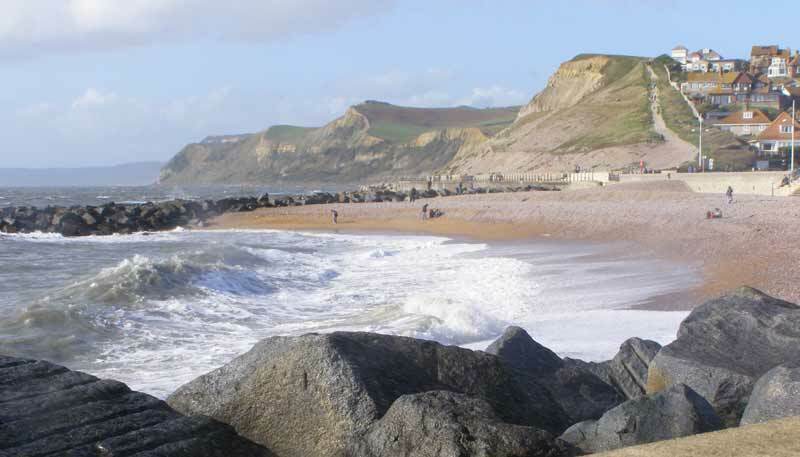 It looks rather different with the tide in as seen in these views. 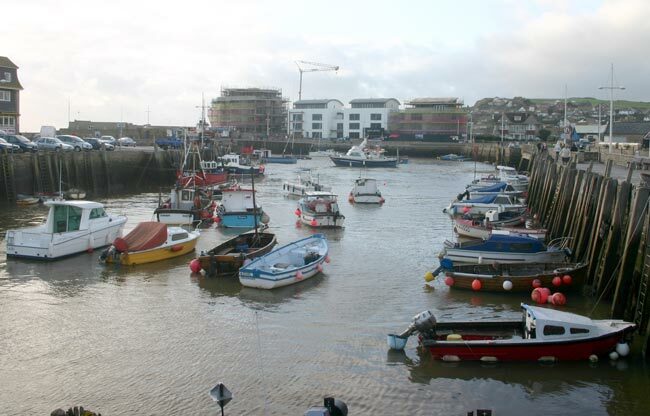 December sees fewer boats in the water, but the sun was still warm - out of the breeze! 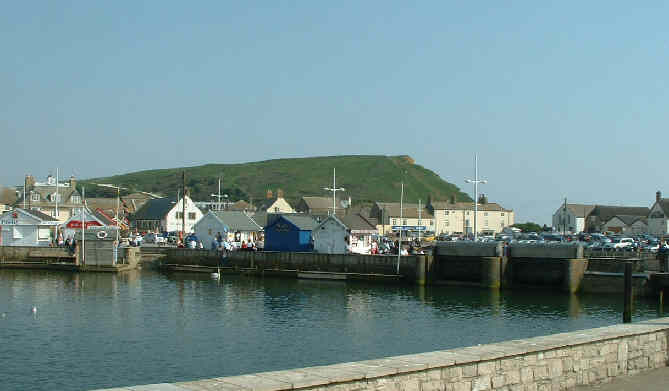 The eastern corner of the harbour is watched over by St. John's Church. 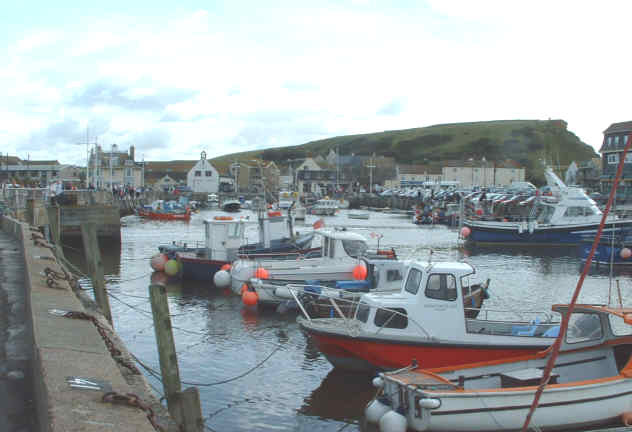 A view across the harbour from west to east. 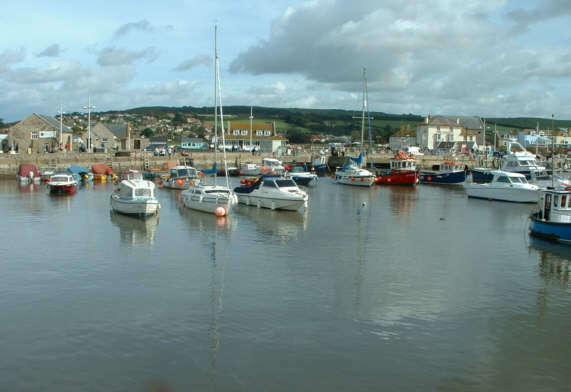 A panoramic view of the harbour. 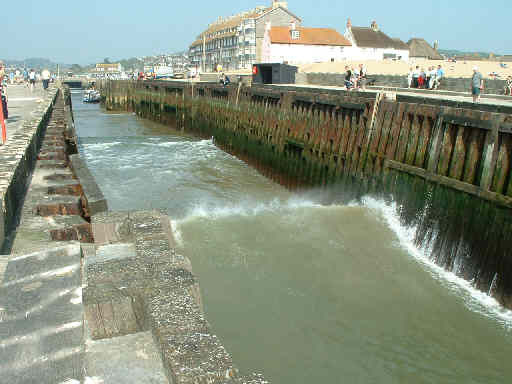 The river is held back by sluice gates which maintain the water level in the river during the summer. 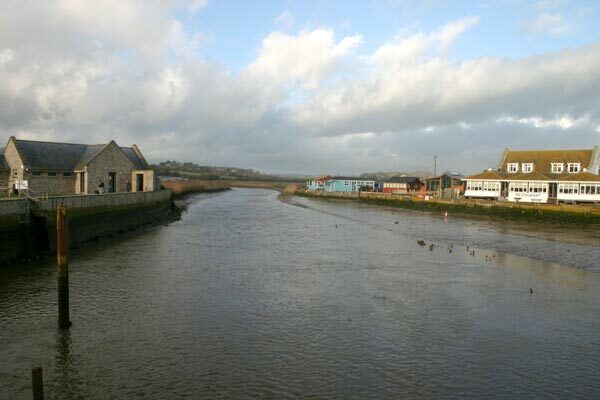 The changing face of the seasons, compare the above summer view of the river water with this December one. 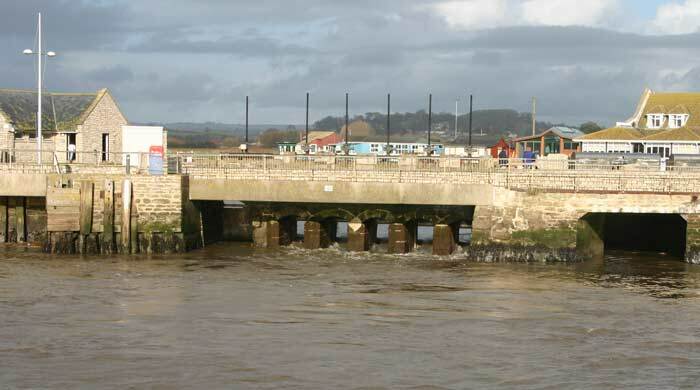 In this late November view the sluice gates had been opened following heavy rain, though with the height of the tide there wasn't much difference in water levels either side of them. 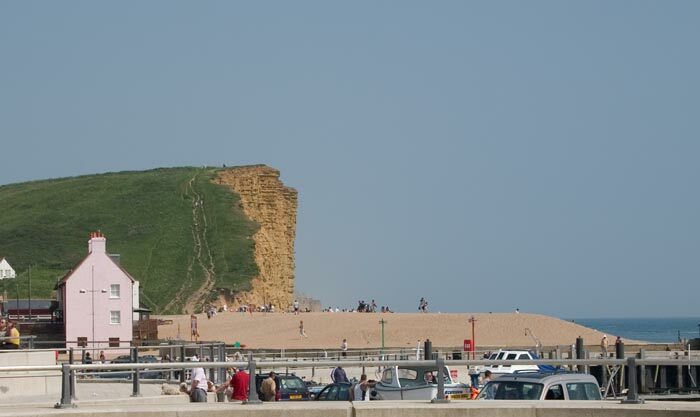 From a slightly higher vantage point (the steps to the café!) 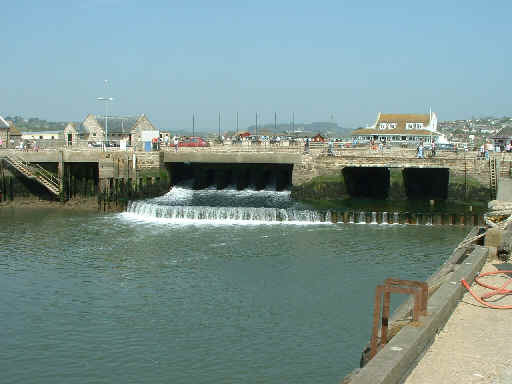 you can see across the dam to the river beyond. 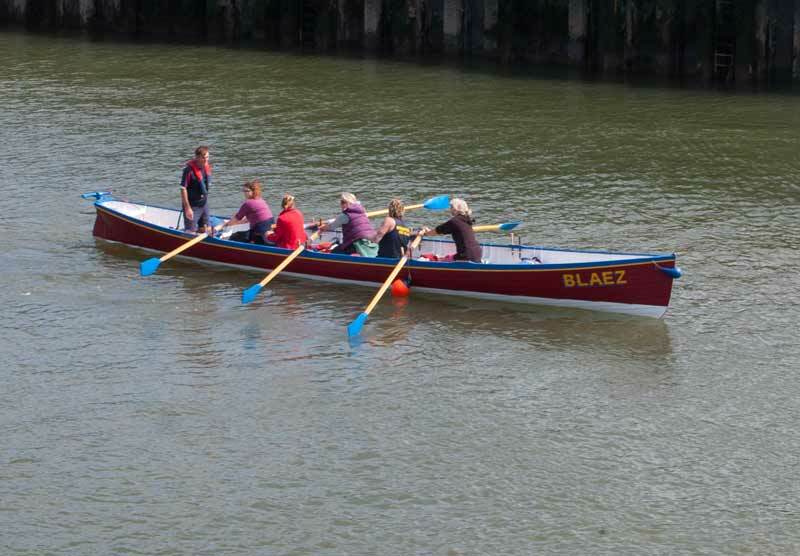 Above the sluice there is a small lake, where you can hire rowing boats - you can get 2 1/2 miles up river to Bridport if you feel that energetic! 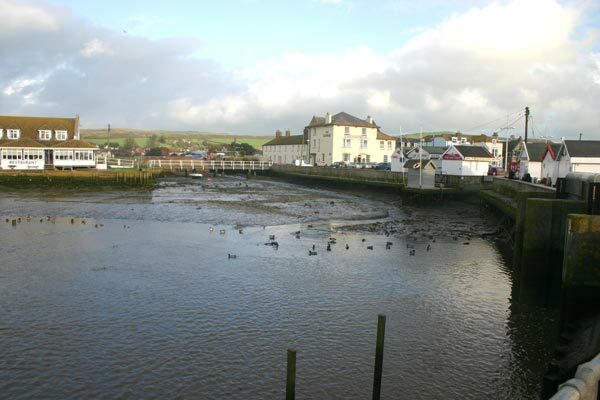 Two views of the lake on the November day when the sluice gates were open - a marked contrast to the summer view above. 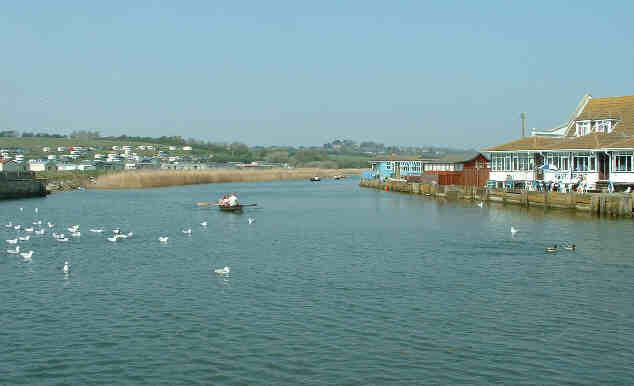 Looking across the river towards East Cliff. 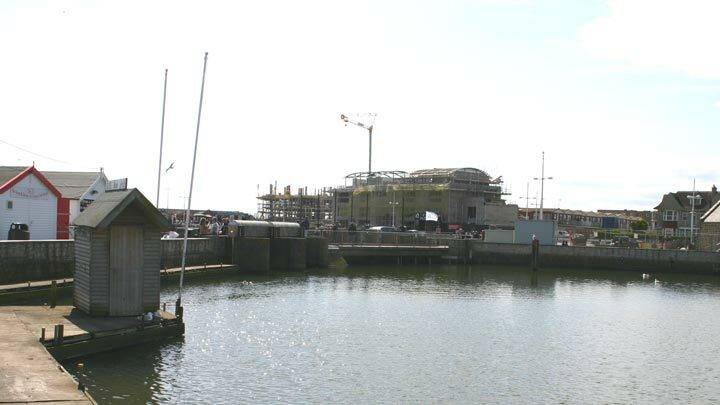 New development taking place alongside the harbour seen across the lake and the sluice gates. 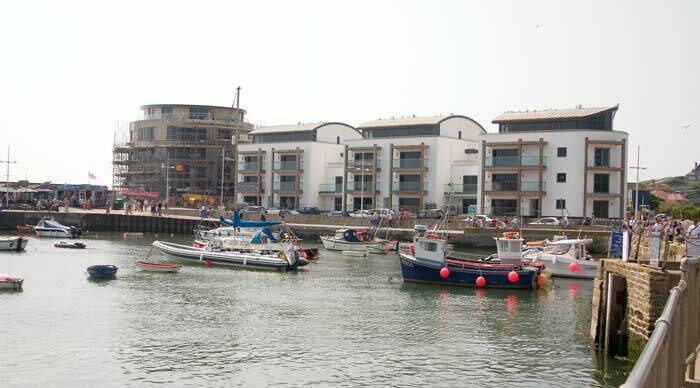 Six months later the new flats have grown, they seem to intrude more than the similar height block on the other side of the harbour. 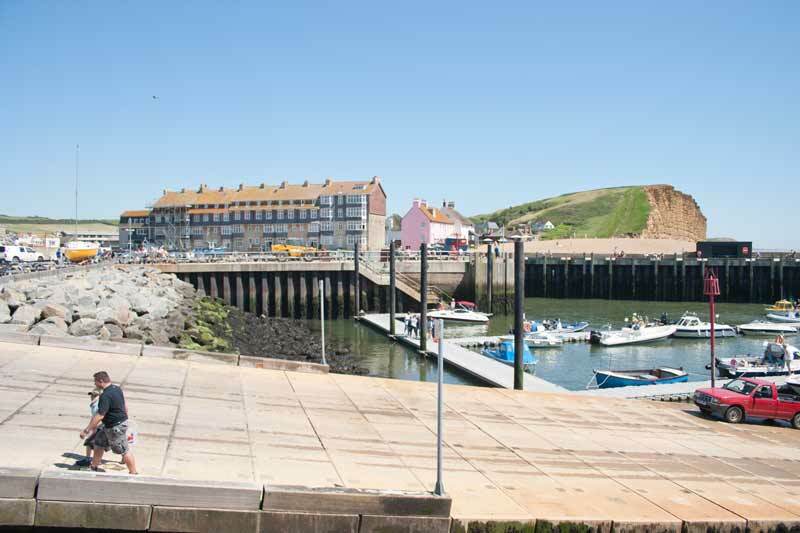 Another six months progress and the new blocks are nearing completion by the look of them. 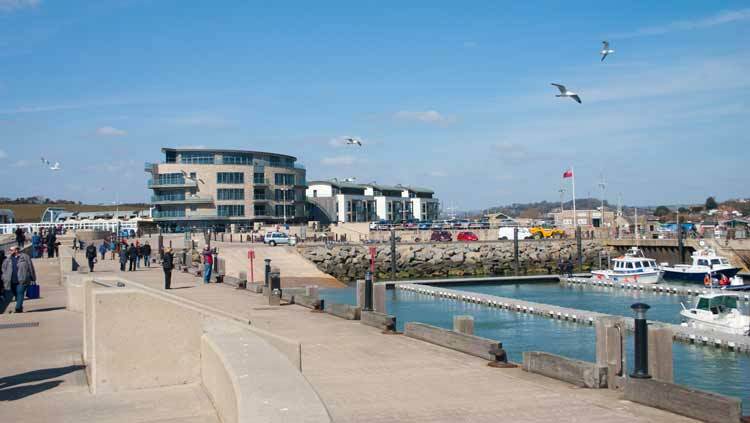 Five years on and the completed development is now beginning to lose its newness and become a normal part of the scene. 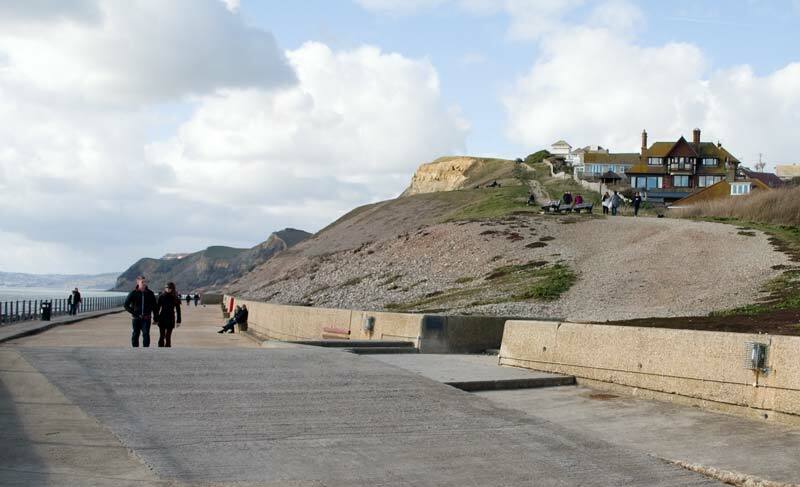 The circular blocks on the other side had been completed in these views from August 2008. 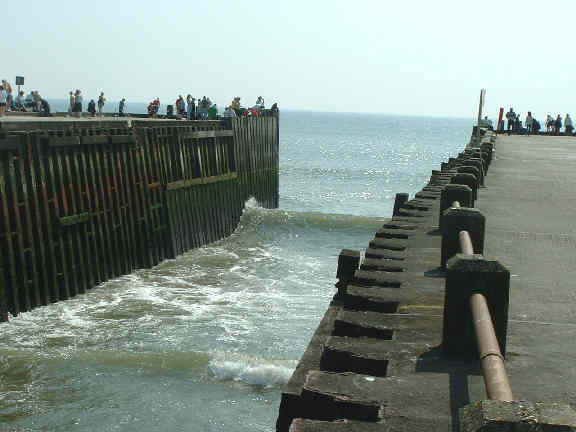 The old entrance to the harbour was cleverly arranged to deflect waves to one side so that they didn't actually get right into the harbour. 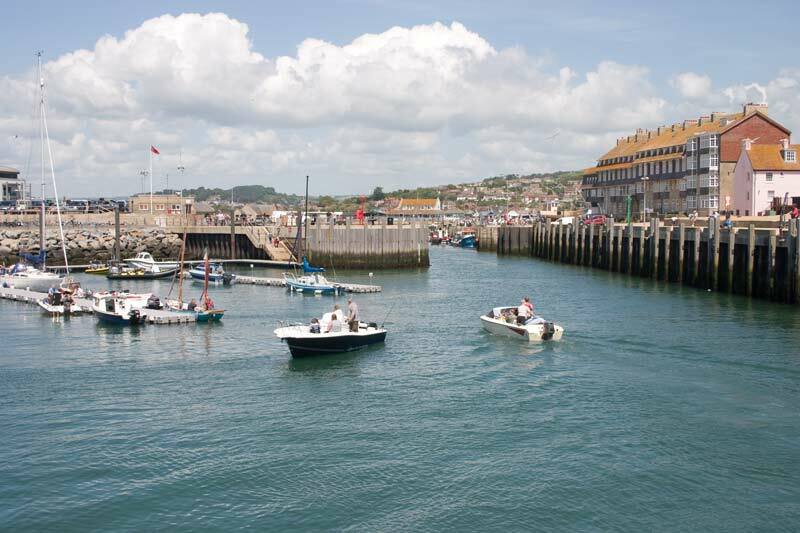 Even when it is calm there seems to be quite a sea running at the mouth of the harbour, as those standing right at the end can find out! 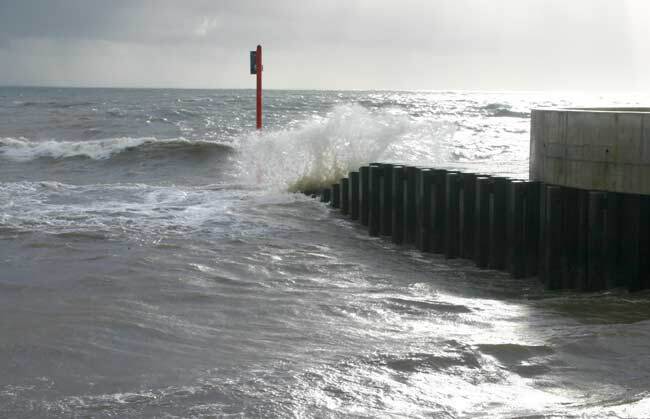 As the tide rose the waves got into the channel before breaking as can be seen in these two photos. 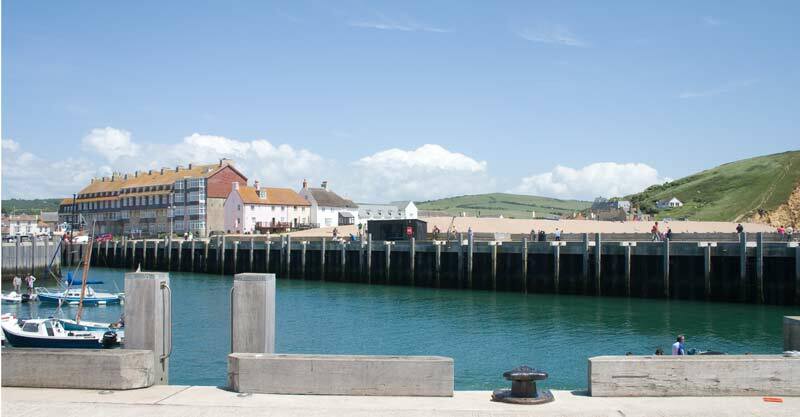 The harbour has been improved, the West Pier (on the right above) has been partially demolished and replaced by a new pier, the stub of the old can be seen in this view. 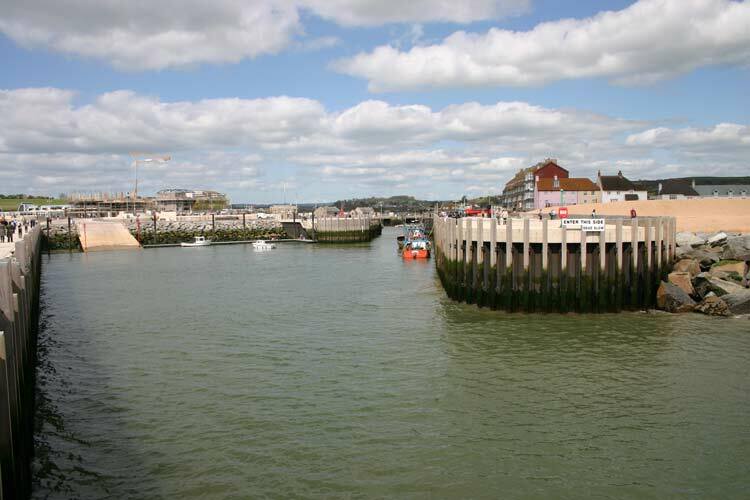 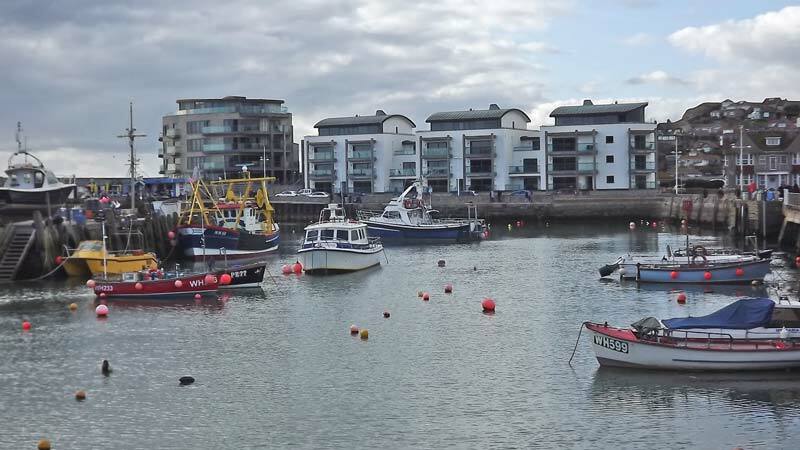 The changes will provide more space for boats in an outer harbour with a new slipway seen here. 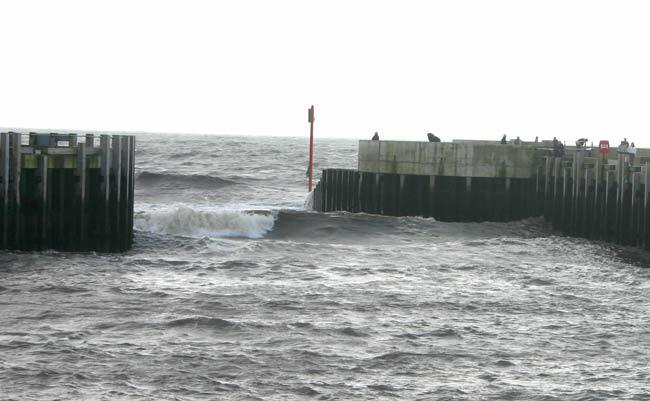 Three views of November waves breaking in the new harbour mouth. 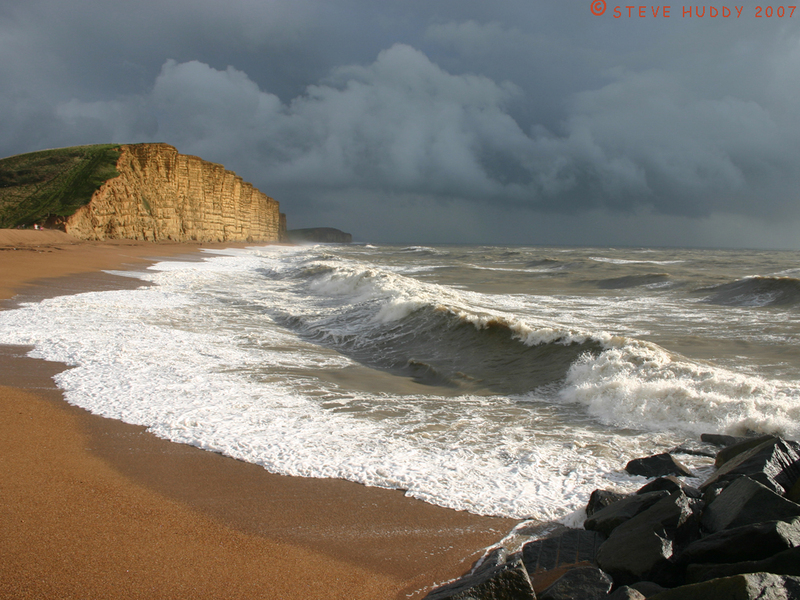 Breakers on the beaches either side of the harbour mouth on the same stormy November day. 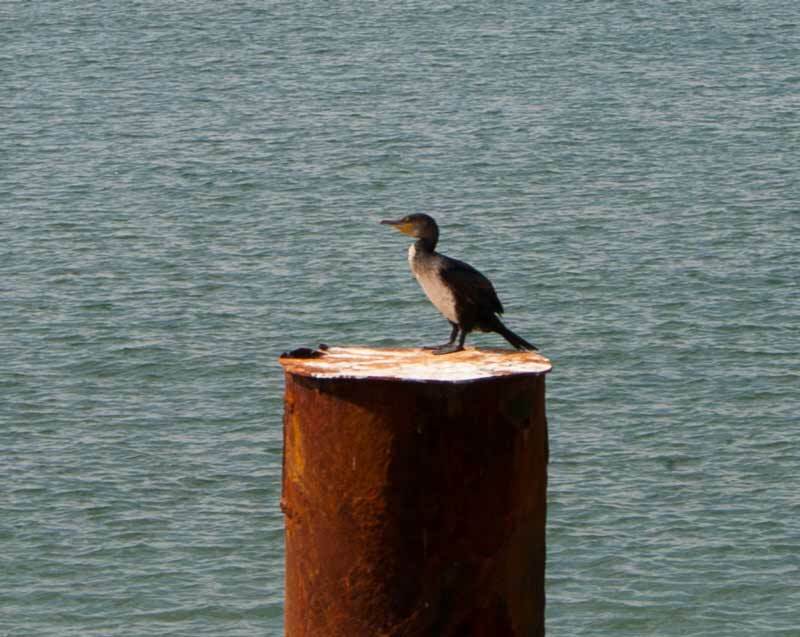 The left hand photo is available as a wallpaper sizes 1024x768 and 1280x960 , click on the size you want, when the image has opened right click then click on "Set as background". 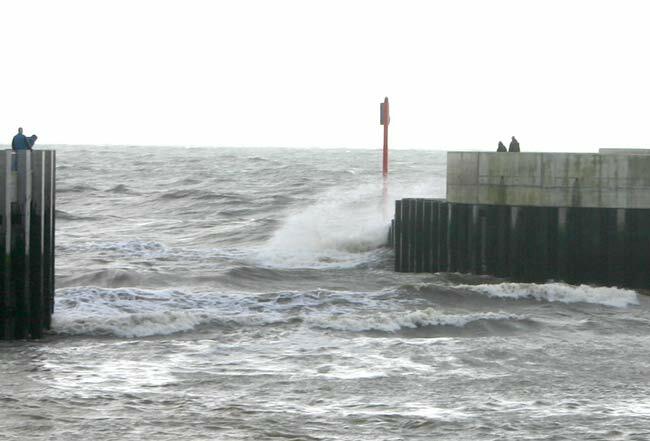 More waves seen from the new West Pier. 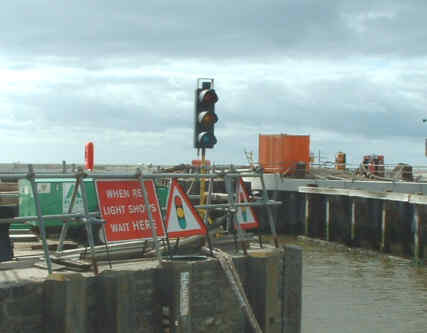 While the works were in progress movements of boats was controlled by temporary traffic lights! 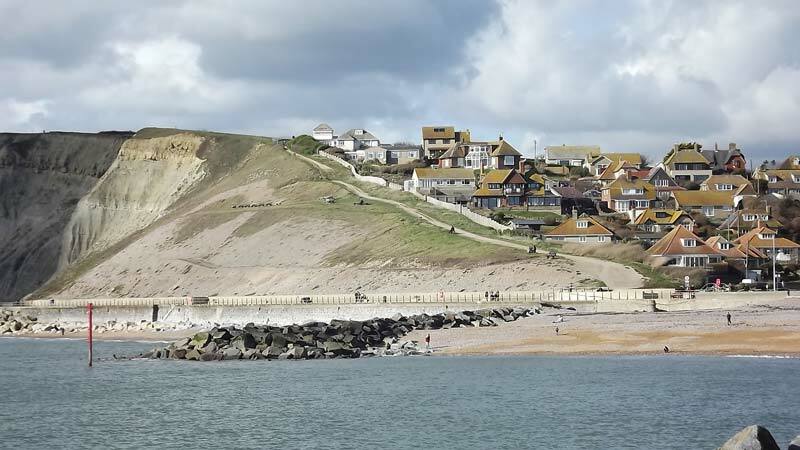 A December view along the now complete new pier. 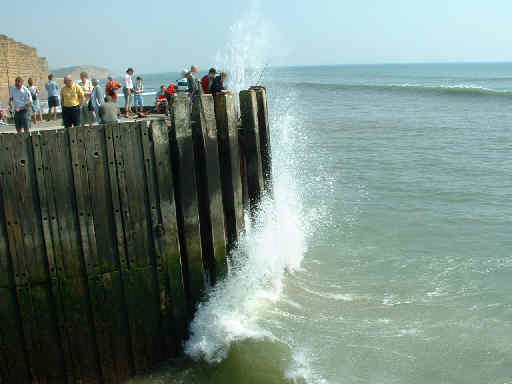 The new pier seen from the seaward side, with the September waves breaking against it. 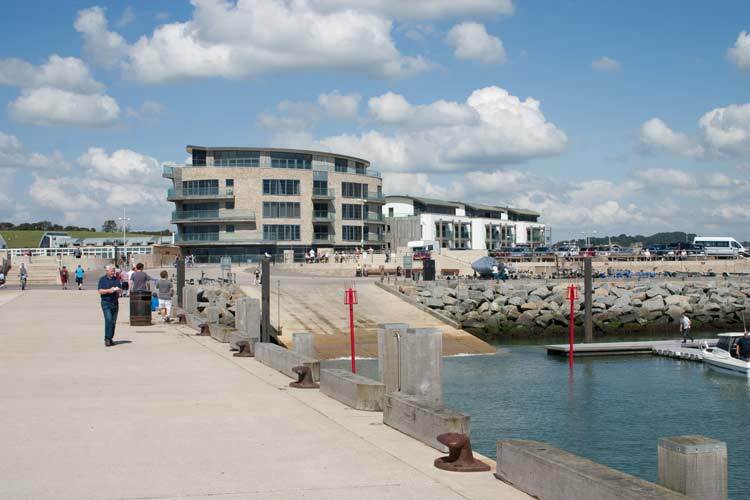 The view from the seaward end of the new pier showing the new new outer harbour. 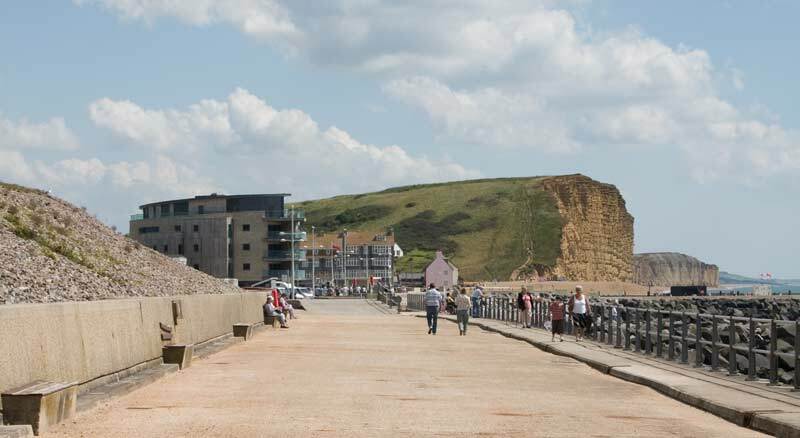 Looking along the new pier with the cliffs in the background. 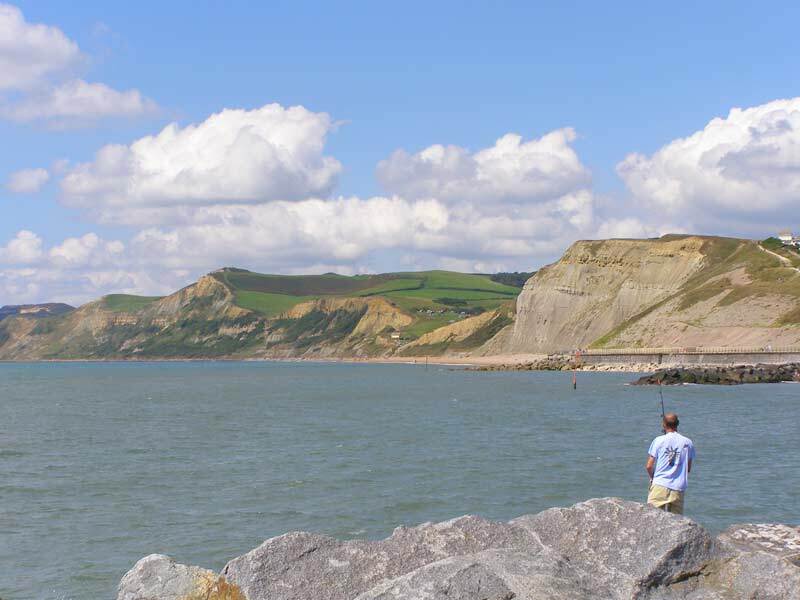 The end of the pier provides a good view of the cliffs to the east. 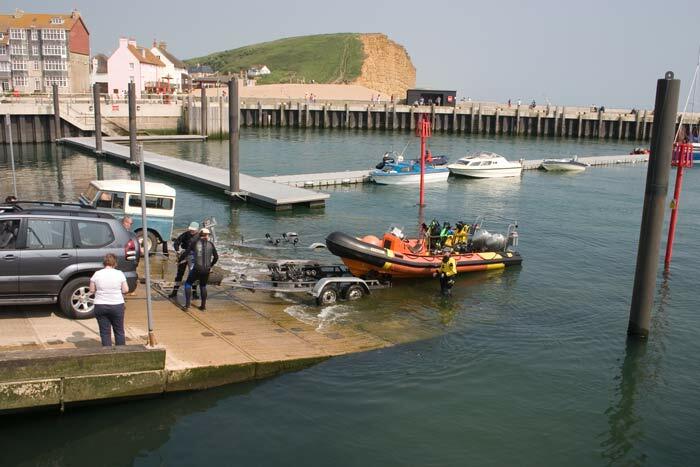 The new slipway seems popular judging by the number of trailers parked nearby, here a boat is being got out of the water. 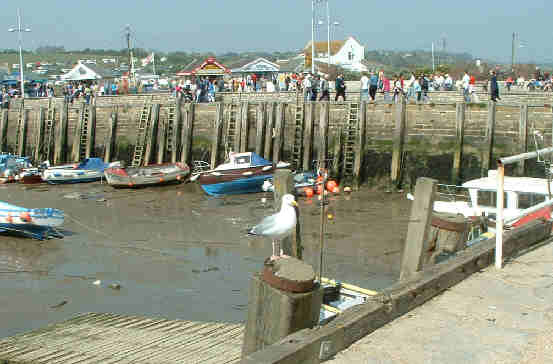 A view across the slipway and moorings to the cliffs behind. 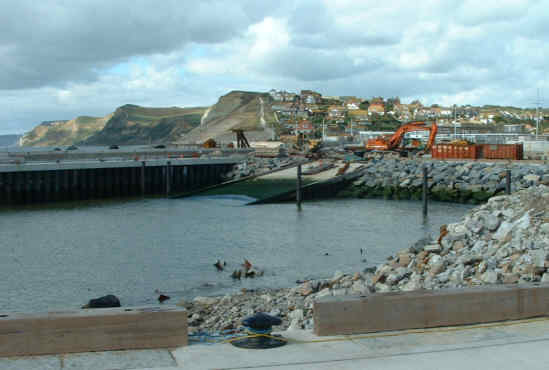 Looking across the new part of the harbour to the cliffs and beach beyond. 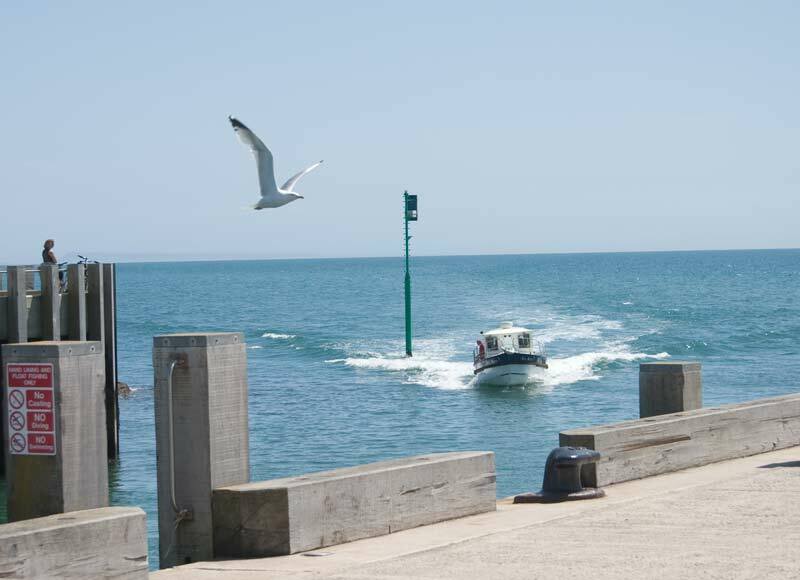 A small boat entering the harbour as a herring gull flies past. 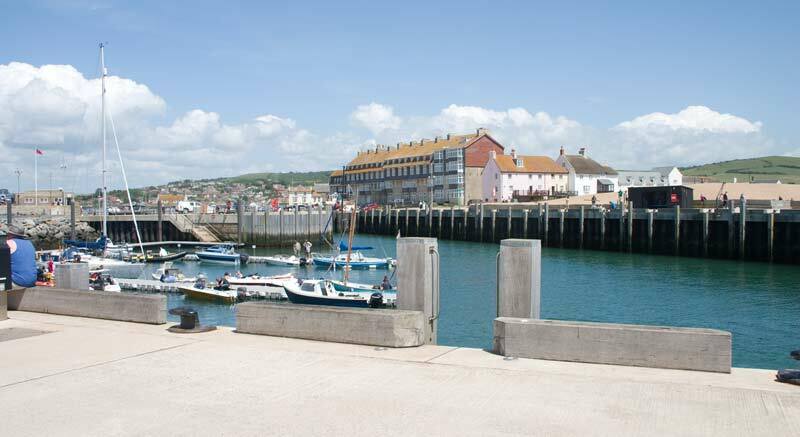 Two views showing how close the sea and countryside is to the harbour. 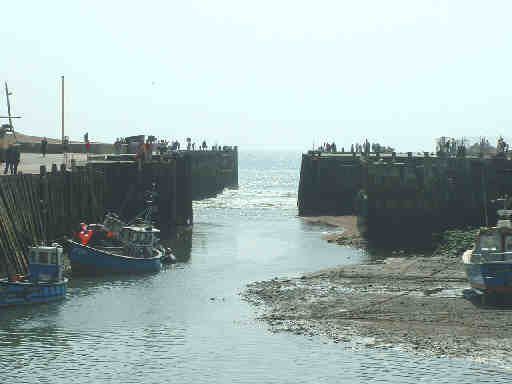 A party of divers about to leave the harbour. 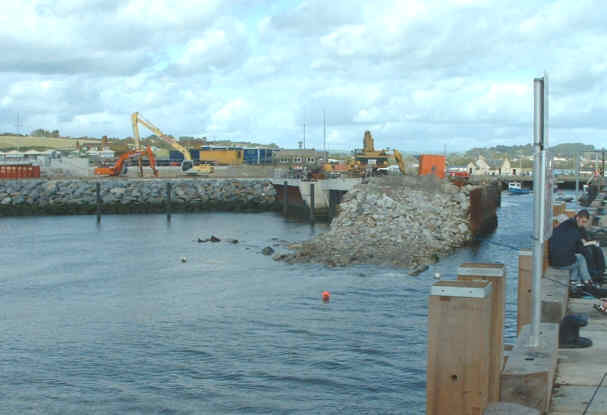 Two photos of activity in the outer part of the harbour. 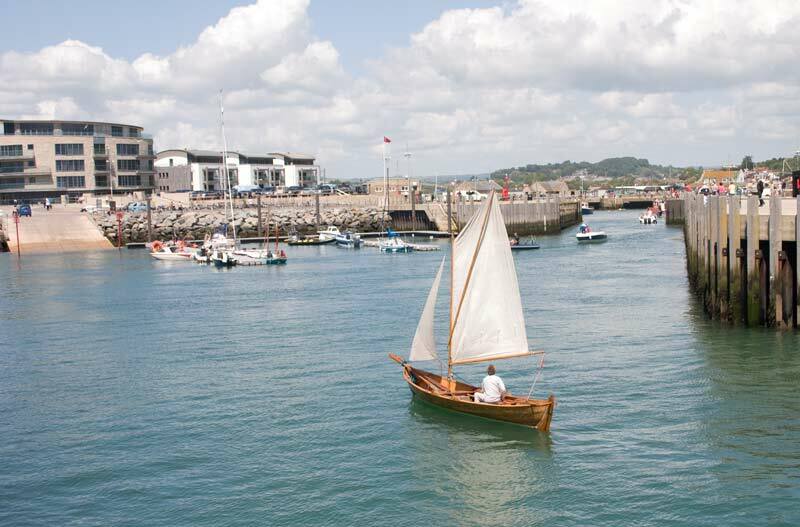 A small wooden sailing dinghy coming into West Bay. 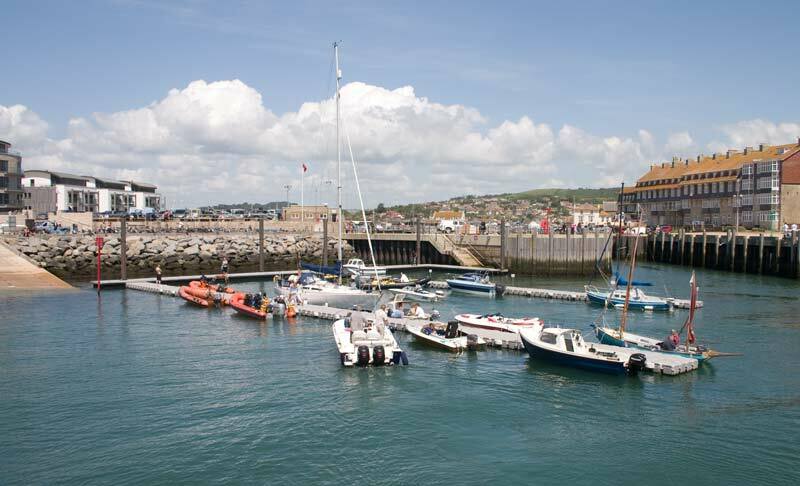 Three racing gigs entering West Bay harbour after a race outside - more photos of this come soon! 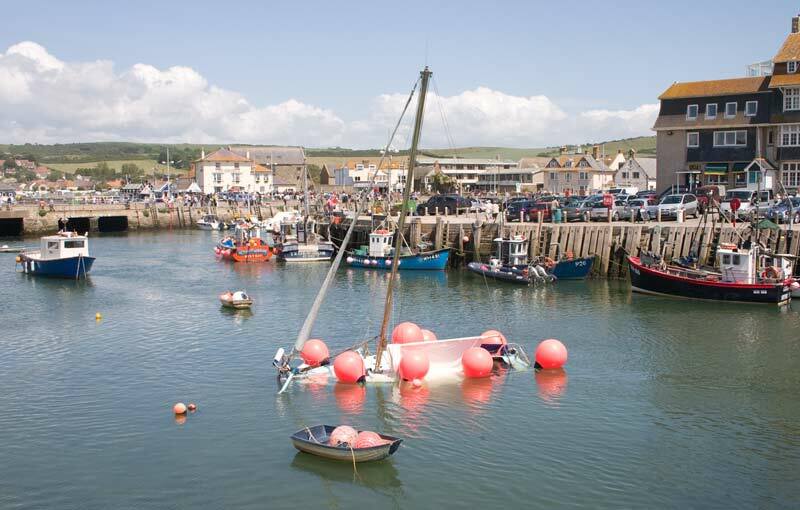 A reminder of the perils of the sea, this yacht had gone aground the previous night near West Bay and had been brought in using flotation buoys at high tide. 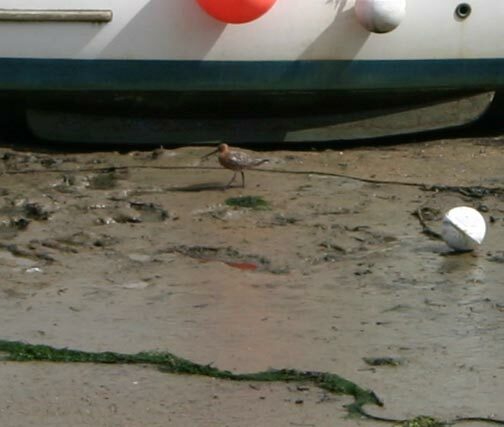 With the tide out a black-tailed godwit searches the harbour for a meal. 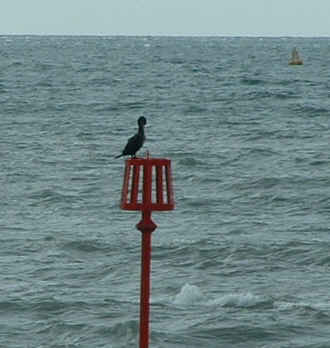 Same site, different day sees another cormorant resting on the same navigation marker. 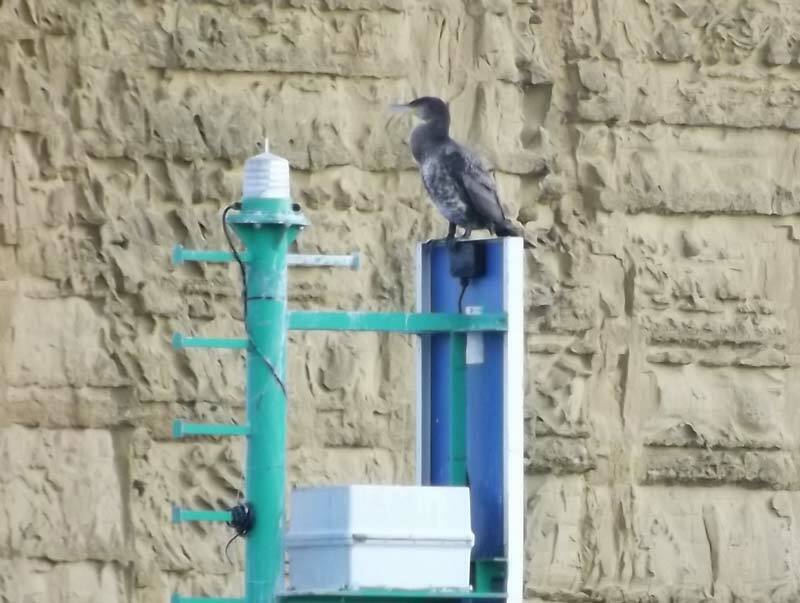 Another navigation light, another cormorant - this time with fields and cliffs in the background rather than the sea. 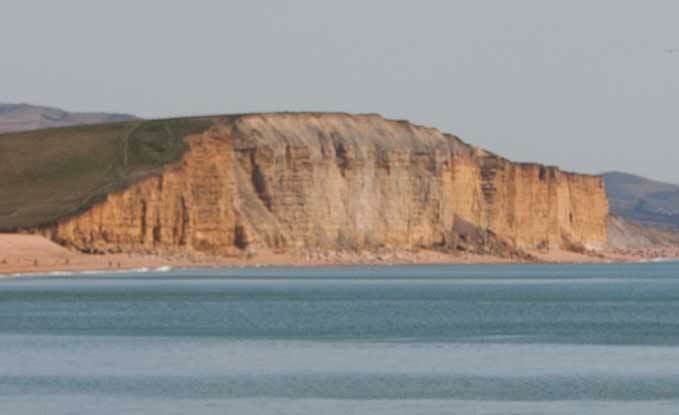 Looking across the harbour towards Burton Bradstock, Chesil Beach and, almost lost in the haze, Portland Bill. 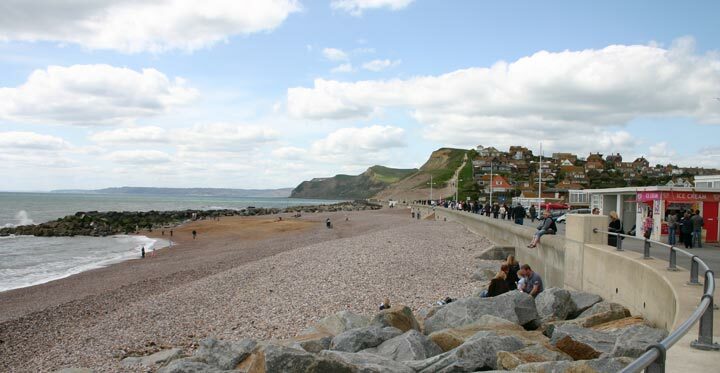 Looking along the coast showing the start of Chesil Beach, which disappears below the horizon, to a distant Isle of Portland. 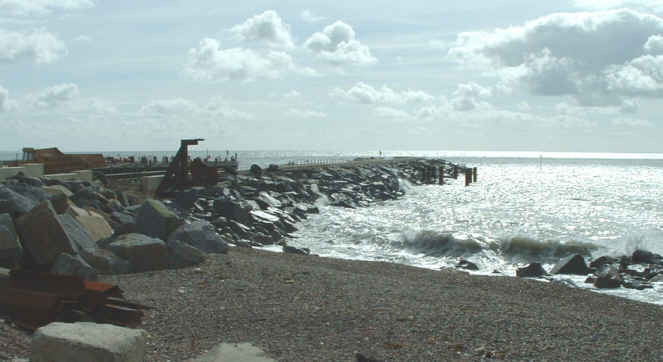 Looking east from the harbour mouth at the cliffs beyond. 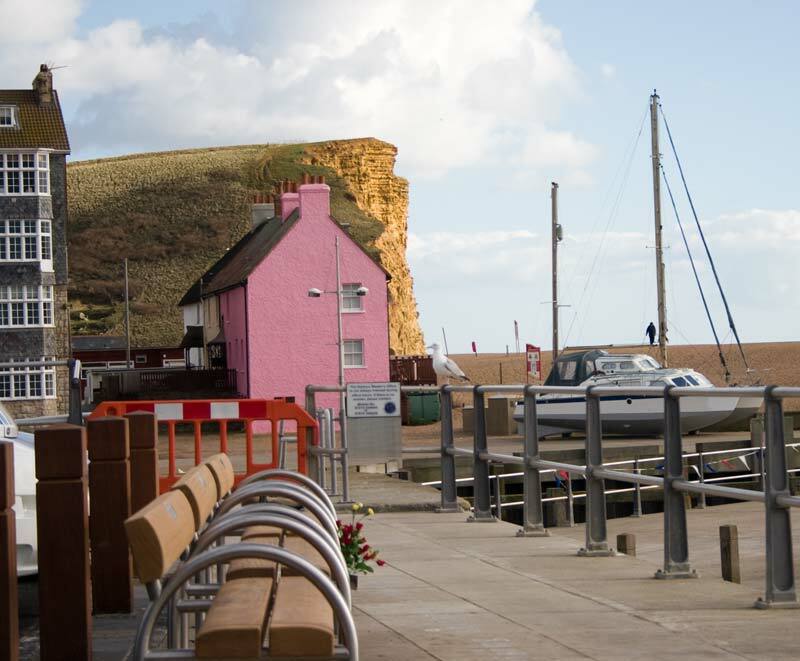 The view from seats near the boat trailer park with a Herring Gull posing on the railings, a pink cottage and sheer cliffs beyond. 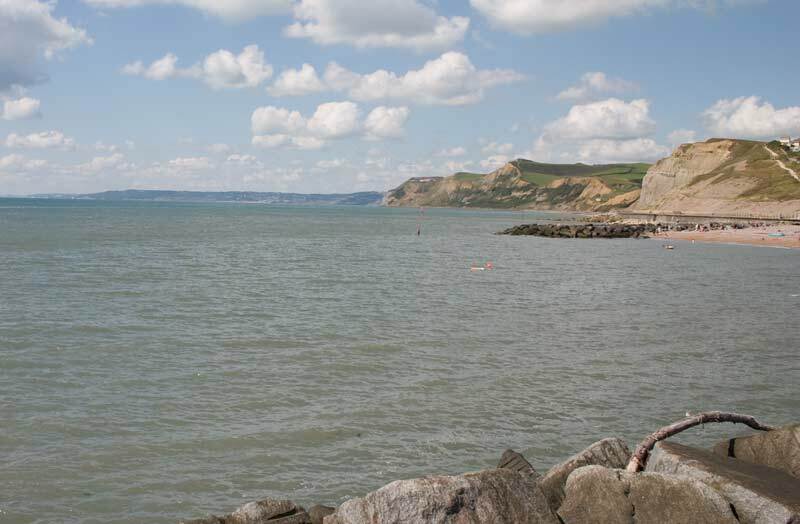 Looking west towards a distant Lyme Regis. 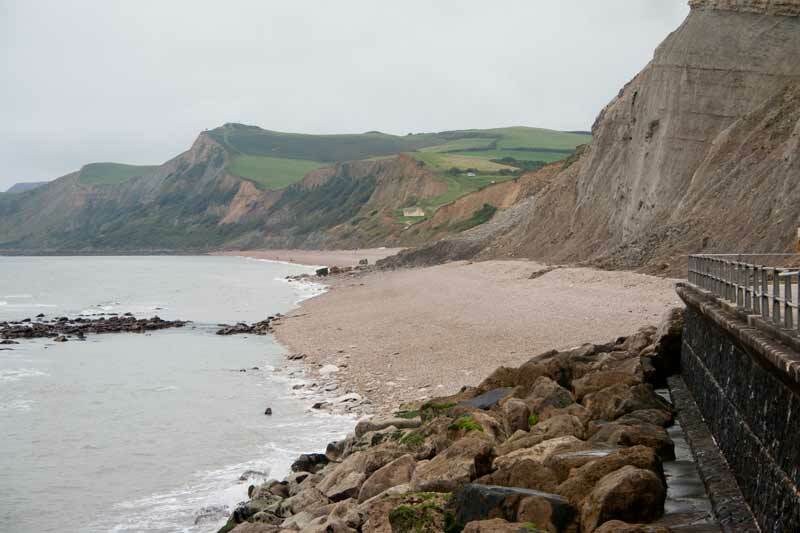 Two views of the South West Coast Path climbing the cliffs from the sea front leading on to Golden Cap, Charmouth and Lyme Regis. 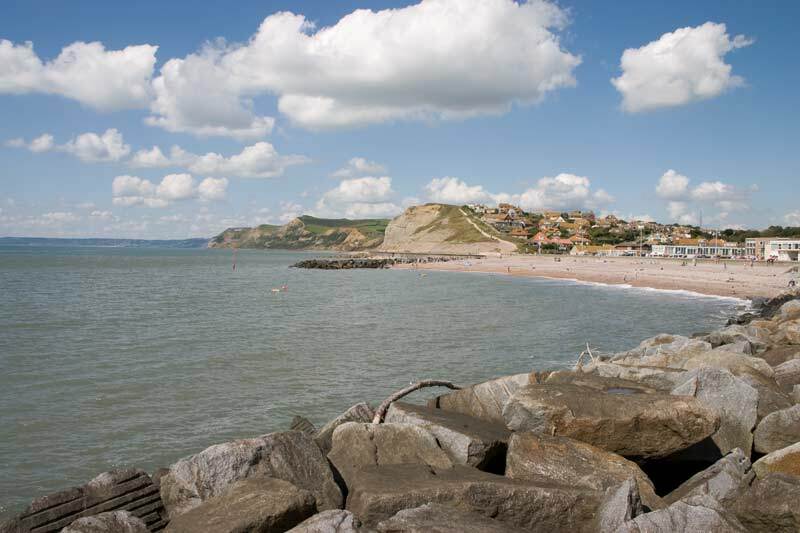 Three more views looking west taken from the new pier. 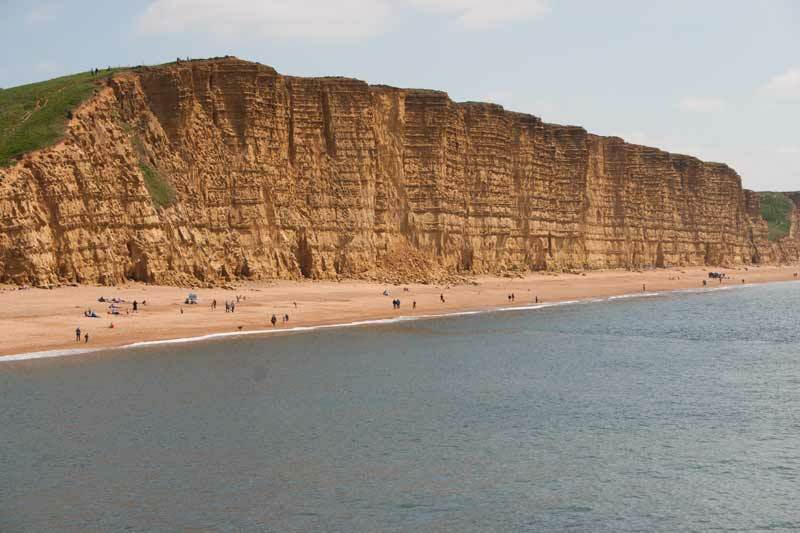 A closer view of the strata of these rather soft cliffs. 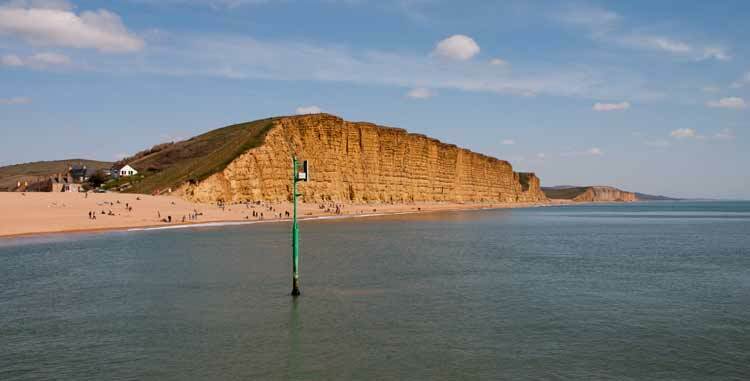 There has been sad news of a fatality following a cliff fall east of West Bay, no injuries in this fall to the west but you can see how far across the beach it spread. 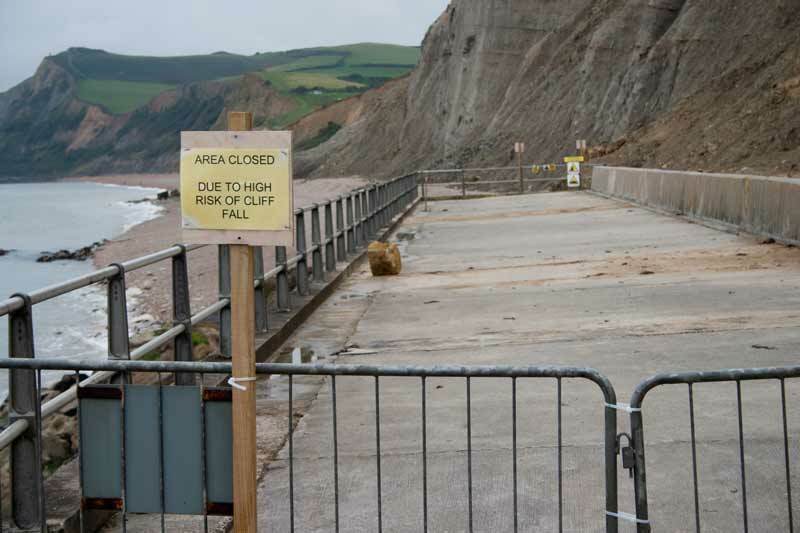 Another fall had led to the closure of the far end of the promenade - the sign is almost superfluous given the size of that rock. 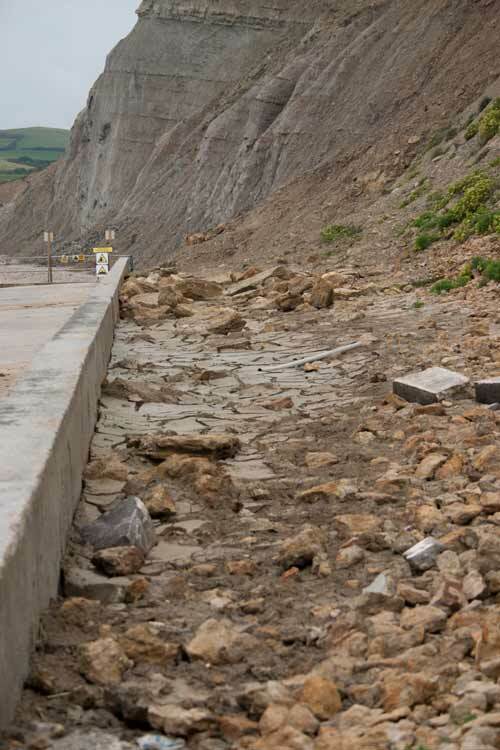 There used to be a gap between this bit of the prom. 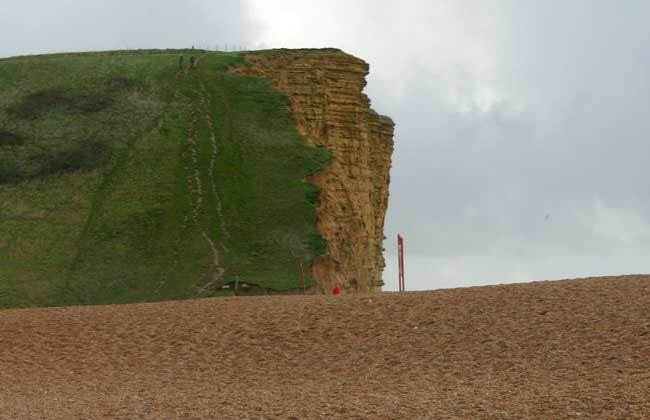 and cliff but it has steadily been filled by falling rocks, mud etc. 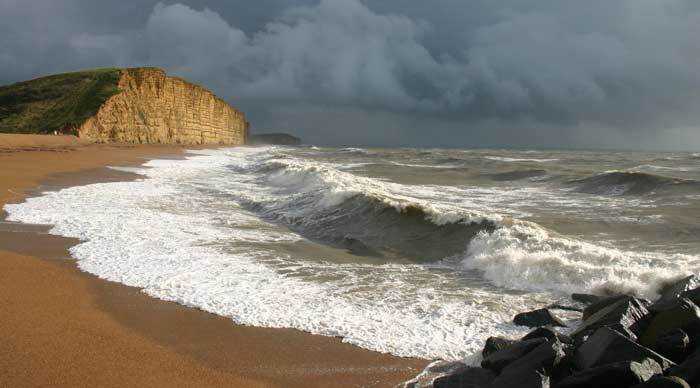 The very wet weather this summer (2012) has led to a lot of such falls - be careful near cliffs, keep further out on the beach for safety. 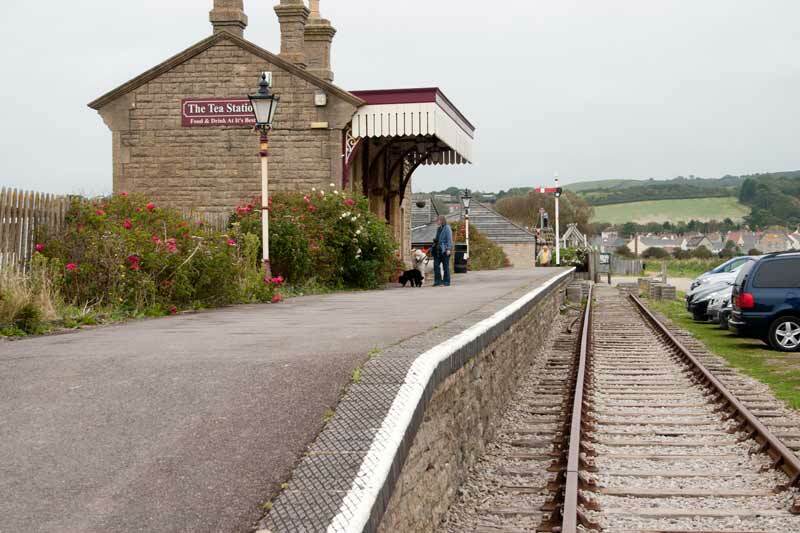 The railway line to West Bay closed to passengers in 1930 and to goods in 1962 - the railway from Maiden Newton to Bridport lasted until May 1975. 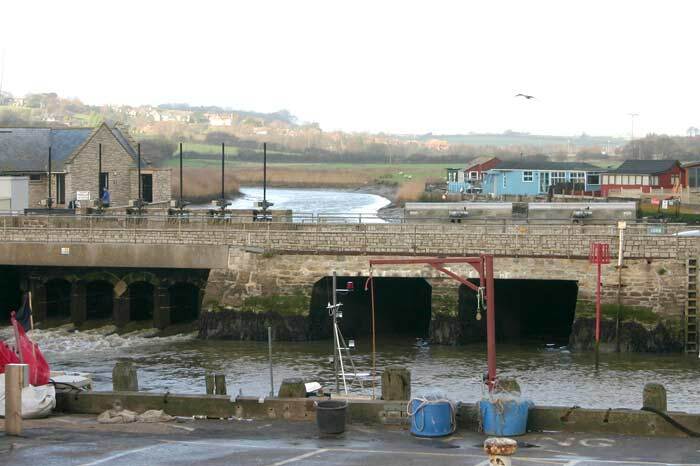 Having been used as offices for a boat yard the station buildings are now used as a café. 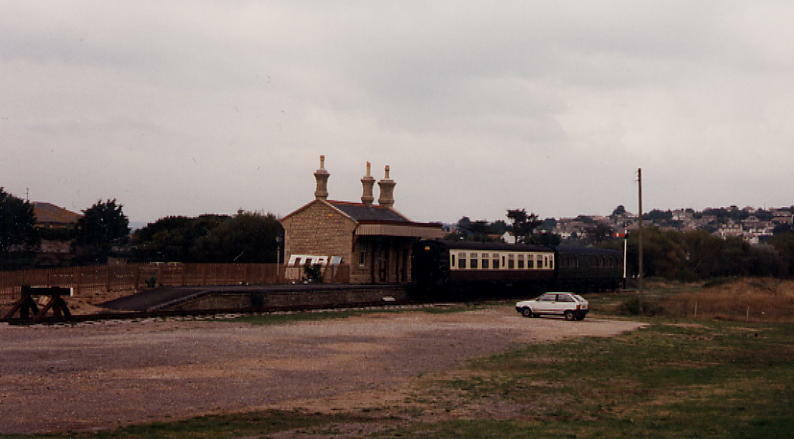 This 1990s view of the station shows the two carriages that were used as part of the café, they were replaced by others but now their little bit of track is empty. 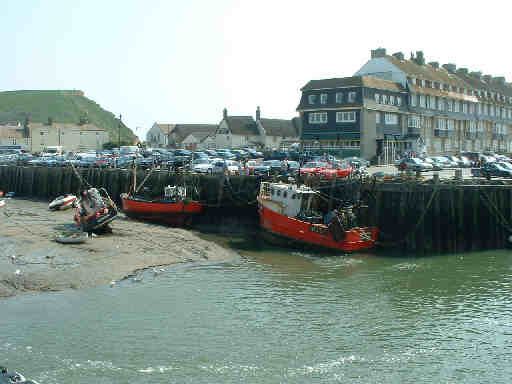 The foreground is now a car park.